Few historians possess more knowledge of the terrain of Civil War battlefields and the tactics employed on them by the contending forces than does Earl J. Hess. From Pea Ridge to Petersburg, Hess has studied the deadly game of feint, maneuver, attack and defense. He brings his lifetime of expertise to the deadly red dirt dance macabre performed by Union and Confederate forces in the campaign for Atlanta. He rightly concludes that the Battle of Ezra Church, fought July 28, 1864, was an intense, but underappreciated, battle in that campaign. Hess divides the Atlanta Campaign into two parts: the first from Chattanooga to the Chattahoochee River pitting Union Major General William T. Sherman against the ever-cautious Confederate General Joseph E. Johnston; and the second south of the river to the gates of Atlanta between Sherman and newly appointed and offensive-minded Confederate commander John B. Hood. 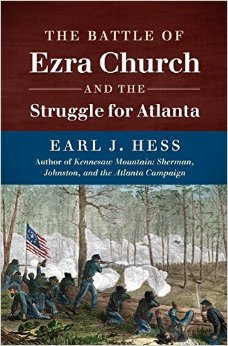 Ezra Church was the third engagement between Sherman and Hood but, as Hess pointedly observes, "the primary tactical context was the domain of division, brigade, and regimental commanders." Although generally considered a decisive Union victory, Hess maintains "The Confederates came closer to victory at Ezra Church than they had a right to expect" and only the grit of a thin blue line on the Union right possibly prevented a decidedly different outcome. In setting the stage for describing the battle, Hess emphasizes the many command changes that occurred in both armies, somewhat unusual in the midst of an ongoing campaign. "The shake-ups in blue and gray," he writes, "were now over just hours before the battle of Ezra Church began." Both commanding generals had good, if somewhat complex, plans. But, Hess reminds, "all plans are dependent on the players and the decisions they make at critical junctures in the flow of events." And the major players--Union Major General Oliver O. Howard, just appointed the new commander of the Army of the Tennessee, and Confederate Lieutenant General Stephen D. Lee, who took command of Hood's old corps only the day before the battle-- were new and inexperienced at the tasks before them. Sherman planned a flanking movement to the right, a favorite move that he employed with success against Johnston. The Army of the Tennessee would move from the far left of the Union forces and swing around to the west, aiming for the last open rail line south of Atlanta at East Point. In spite of strenuous efforts at secrecy, Hood learned that the Federals were on the move. Hood was no Joe Johnston and "The army commander intended to strike at Sherman before the Federals could reach the vital rail link between Atlanta and Macon." Hood knew if Sherman broke this lifeline, he would have to abandon Atlanta. The focal point of Hood's planning was The Lick Skillet Road at the end of the Confederate defensive line. That road intersected with a road that ran past Ezra Church, just three miles south of Atlanta. Stephen Lee had the responsibility of holding that vital road juncture while other Confederate forces would attack the Union flank and rear. Hood planned to open the ball the morning of July 29. But, after heavy skirmishing, Lee jumped the gun. Against explicit orders, he attacked on the 28th. Hess calls it a tragic mistake and comes down hard on Lee. "He [Lee] had scant information about the main Union position and did not know the terrain," Hess writes. "He did not even know his own troops, and he did not bother to inform Hood of his decision, much less ask his advice about the matter." Hess concludes that Lee "failed to obey his orders and exercised far too much latitude in taking a course of action that would kill and wound thousands of his men in a battlefield endeavor with dubious prospects." To make matters worse, Federal observation posts detected the movement of the large Confederate force and "had sufficient warning of trouble to be ready for it." Battle narratives, of which Hess is a master, can easily devolve into a litany of names and numbers. Good maps and lots of them can mitigate this tendency. As good as he is, Hess could have benefited from additional, and more descriptive, maps. Most historians characterize Ezra Church as a clear-cut Union victory, and the body count bears that out. Of just over 9,000 engaged, Howard lost 632 men. On the other hand, of almost 11,500 Confederates involved, Lee lost about 3,000. Nevertheless, Hess agrees with Henry Wright of the 6th Iowa, who argued Ezra Church "was the most stubbornly contest and bloodiest battlefield of the campaign." Hess maintains that "[d]espite the disjointed nature of Lee's attacks, the Confederates mostly conducted the battle with a deal of spirit and came closer to success than one had a right to expect." The soldiers who fought there--both blue and gray--would probably agree.